The album that earned two nominations at this year's LA Music Awards - Dance Artist of the Year, and Pop Single of the Year for "Finger on the Trigger". Also includes the hit singles "Feline" and "Come Up Fighting" (featuring Pink Floyd's Durga McBroom). 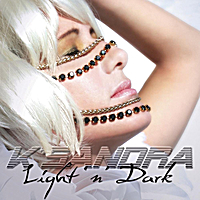 An amazing accomplishment for an indie release, "Light 'n' Dark" features collaborations with producers and songwriters who have worked with the likes of Snoop Dogg, Usher, Seal, Fergie, and Slash, and even a duet with Durga McBroom of Pink Floyd fame. As K'SANDRA describes it, "it is music to move your feet, but with a rock 'n' roll heart". To us it represents the true spirit of breakthrough indie due to its genre-bending creativity and diversity, yet commercial appeal. 5 of the CDs in circulation contain "golden tickets", the recipient of which will win a trip to attend a future K'SANDRA recording session or music video shoot (depending on artist's schedule). A winner will also be randomly drawn from among digital downloads.